Lead rot is the bane of toy soldiers everywhere, about as welcome in a collection as the Red Death was in Poe’s story. You will also hear it called “lead disease” or sometimes just “plague.” It is a form of corrosion that eats lead much as rust eats iron, and if left unchecked it can destroy an old toy soldier. It has even been known to eat its way through entire collections. There have been a number of articles about lead rot in collector’s journals over the years, but the definitive one was Bert Caldwell’s piece in issue #13 of TOY SOLDIER AND MODEL FIGURE, a very thorough and well researched examination of the subject. I urge you to get a copy if you can find a back issue. There’s also a piece by Peter Ruddle in a prior issue of the same magazine, but that one has several mistakes that Caldwell’s article corrects. Iron rusts red. Lead rusts white. White or greyish-white powder is a sure sign of lead rot. It often shows up first on an extremity; the tip of a sword, the edge of a cape, a helmet crest, the figure’s base. An afflicted figure will also sometimes seem to “sweat.” The first time I knew I had a problem was when I noticed that one of my old Timpo knights seemed to have dandruff. The afflicted figures will also feel rough to the touch, even where the paint is still intact. And lead rot has a distinctive smell as well. It’s hard to describe, but once you smell it you won’t forget it. These days, if I am buying an old figure and I suspect lead rot, I always give the knight a sniff or two. Modern metal figures cast in pewter or white metal are immune, so you don’t have to worry about your Bob Hornung knights, your Brian Roddens, or your Greenhills. I do worry about my Russian figures sometimes, simply because there are so many makers over there, and god knows what sort of metal some of them are using. So far, however, my fears have been unfounded. None of the Russians in my collection have shown any signs of lead rot (knock wood). Older figures, made of alloys with a high lead content, are much more prone to lead rot than current production. Timpo knights are definitely vulnerable, as are figures from Johillco, Crescent, Cherilea, and their smaller rivals. Britains figures can be afflicted too, but less so, in my experience. I suspect that Britains used a higher grade of metal, with more tin and zinc in the mix. Courtenays can also develop lead rot, but it’s not a common occurance, thank god. Pings, though… Pings will get lead rot if you look at them crosseyed. Ping was a wonderful miniaturist, but he cast in a very soft lead. Pings and Ping-Courtenays are prime candidates for the plague, and need to be inspected carefully before purchase. The causes… well, Caldwell nailed the bigs ones. Humidity, to start with. I am fortunate in that I live in New Mexico, a very dry state. A fellow collector of my aquaintance bought a lot of Courtenays from Hawaii a few years ago, but when they arrived they all had terminal lead rot. A couple of the mounted figures pretty much disintegrated in transit. Severe lead rot will do that; it can actually eat a figure until it crumbles. The humid air of Hawaii was likely the culprit. Lack of circulation is the other cause Caldwell mentions, and he’s right there as well. When I started collecting in 1996, I commissioned my favorite woodworker to make me a custom display cabinet. It had wooden shelves, a mirrored back, and a plate glass door… and it was airtight, to keep the figures from getting dusty. I filled it with my favorite knights… and to my horror, several months later, I noticed that a number of them had bad cases of dandruff. The cabinet was TOO airtight. My efforts to protect my knights from getting dusty had given them lead rot. That cabinet now holds only plastic figures. “Let them breathe.” That’s the lesson. That’s the best way to prevent lead rot. Courtenays, Pings, Timpos, all the older lead figures should be displayed on open shelves… or in cabinets that allow the air to circulate around them. A fan or ventilation system would be great, but you don’t need to go that far. One of my big display centers is an old entertainment unit that used to hold my TV, VCR, turntable, and the like. I put glass doors on the front of all the compartments, but I left the back wide open. The unit is against the wall, but there’s a gap of an inch or so because of the floor molding, so air comes in through the back, and I’ve had no lead rot in that cabinet. Let them breathe. You will also hear that oak shelving is a cause of lead rot. Supposedly the tannins in the oak promote the plague. I don’t know about that one, myself. I have figures displayed on oak shelves, pine, cherrywood, glass, what have you, and have never noticed any difference where lead rot is concerned. My infamous airtight wall cabinet was glass and pine. Some older collectors will also insist that lead rot is contagious, that any afflicted figures need to be removed and kept away from the rest of your collection, or else the contagion will spread through your hosts like the Black Death spread through Europe. That’s an old wive’s tale (an old toy soldier guy’s tale?). If you remove an afflicted figure but keep the rest of his companions stored in the same conditions, they will come down with lead rot too. Quarantine won’t help, if the figures aren’t allowed to breathe. As for a cure… all the king’s horse and all the king’s men can’t put Humpty together again. The damage caused by lead rot is irreversible. You can scrape away the afflicted area and repaint if you’re skilled at restoration, or send it someone like Bob Hornung who is… but you will still have a restored figure, not a mint one. However, lead rot need not be fatal, if you catch it early enough. There is a preventative, which Caldwell talks about in his article. The “elixir” is a mixture of 50 percent pure gum spirits of turpentine (NOT terps substitute, Caldwell warns) and 50 percent highly refined medicinal mineral oil. You need some soft cotton swabs for application. Brush off the afflicted figures, scrape away the rotted areas or the dandruff, apply the solution, gently wipe off excess, and let the figure air dry for seven days. Badly afflicted figures should actually be immersed in a tub of the solution. The same for hollowcasts, where the lead rot sometimes begins inside the figure, unseen. I’ve used Caldwell’s solution. It works. I treated all the afflicted figures from my custom cabinet, and the exilir stopped the lead rot dead. A few years later, I bought some nice Ping-Courtenays from Le Petit Soldier Ship in New Orleans, (where they had been displayed in a closed cabinet), despite the telltale smell and signs of lead rot. I brought ’em home, dosed ’em, and they were fine. I check from time to time, and so far there has been no reoccurance of the lead rot (knock wood) in the figures I treated in 1997 and 1998. The elixir also has a nice side affect: the oil gets absorbed into the figures and gives them a sheen, restoring some gloss to figures that lost it decades ago. Miniaturists who do their own conversions and painting should make certain that the casting is primed before painting, and sealed afterward. Some painters will not bother to prime or seal the underside of a base, or may leave a sword unpainted to preserve its “natural” metal color. That’s an invitation to lead rot. Primer and sealer help protect the figure. Of course, the rot isn’t a problem with kits and castings from current makers like Andrea, Pegaso, and the like, since they cast in pewter and white metal… but when converting old Knights Castle figures and hollowcast Knights of Agincourts, it is something to remember. Oh, and old “home cast” figures are even more spectacularly inclined to lead rot than Pings. In fact, I picked up a really cheap bag of old semiflat homecasts early in my collecting days, almost pure lead, unpainted, and I put one of them in each of my cabinets, for the same reason coal miners used to carry canaries down into the mines. They are my early warning system. If lead rot is in the air, the homecast will get it first and worst. (The one I have in that airtight custom cabinet of mine is so rotted that it looks as though it is covered with a white-grey fungus). That’s the lowdown on the rot. May you never need to face it. On December 26, 2001, I shipped a package of three broken figures to Peter Greenhill in England for repair and restoration. Two of the items were mounted Courtenay knights, rare and valuable. The third was a beat-up foot figure from Britains’ old “Knights of Agincourt” line that Peter was going to convert for me. The package arrived in Bournemouth, England, on January 10, 2002. All the packing material was inside the shipping carton, even the smaller interior boxes in which the figures had been individually packed in tissue paper and bubble wrap. The knights, however, were missing. Somewhere en route, the box had been opened and the figures removed, presumably by a postal employee. After which the box was repacked, resealed, and sent on its way to Peter. The police and postal authorities were notified and conducted an investigation, but found nothing. Thankfully, the package was insured, and the insurance was duly paid… but to date the figures have never been recovered. It is possible that the thief who took the figures will sooner or later contact a Courtenay collector, toy soldier dealer, or auctioneer to try and dispose of his stolen goods. Since all three figures were broken, the thief may also try and bring them to someone capable of repair and restoration. Therefore I am asking all collectors of toy knights and medieval miniatures to keep an eye out. 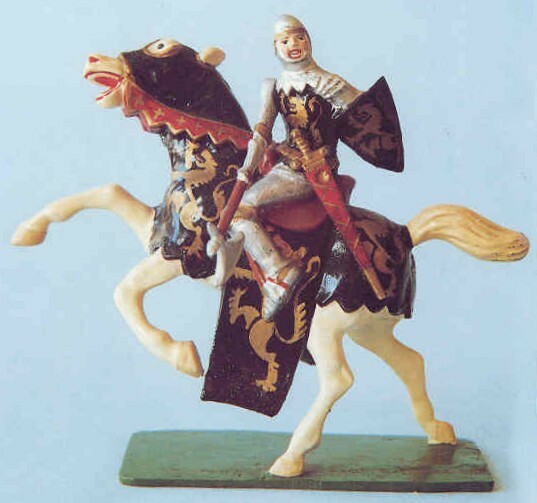 a mounted Courtenay figure of Alain, Lord Montendre, position H-13, most recently sold in the Henry Kurtz auction conducted through Lloyd Ralston Gallery on December 8, 2001, where it was listed as lot 47. The heraldry features gold lions and crosses on a red field, and the finish is glossy. Two legs of the horse were broken; a raised front foreleg, broken near the knee, and the left rear, broken at both base and knee. The stolen figure was painted as Alain, Lord Montendre, with golden lions and crosses on a field of red. 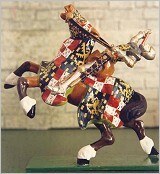 a mounted Courtenay figure of the King of France, position H-11, most recently sold at auction at Sloan’s of Miami on May 20, 2001, where it was listed as part of lot 176. The legs of the horse are broken from the base at the hoof, and the rider’s sword is broken off at the hilt and missing. The heraldry features fleurs de lys on a dark blue field, and the paint is dulled but unchipped. The stolen figure was painted as the King of France, with dark blue trappings decorated with golden fleur de lys. a Britains foot figure, the Knight with Axe from the Knights of Agincourt set, missing his shield, with his axe broken off at the hilt and missing. The figure shows significant paint loss. Should any of these figures be offered to you for sale or restoration, we ask that you hold them and contact myself (in the United States) or Peter Greenhill (in England) to determine whether they are the stolen items. If possible, please get the seller’s name and address and notify the police. It may be that the thief will attempt to restore the broken figures himself before offering them for sale, but the two mounted Courtenays should still be recognizable by their heraldry and the nature and location of their repairs. The offering of this particular grouping of figures — two scarce mounted Courtenays with a relatively common Britains foot figure — may also be cause for suspicion. Insurance compensated me for the value of the knights, but I still mourn their loss. There are only so many Courtenays in the world, and we cannot afford to lose any of them. The H-13 and H-11 poses are not among the very rarest Courtenays, but neither are they among the most common. It is quite likely that the thief who took them opened the box because of the customs declaration, expecting to find jewelry or some other common valuable. When he found some broken toy soldiers instead, he may well have simply chucked them into the nearest trash bin. That is the saddest possibility of all. Maybe you’re a fellow collector of toy knights, model castles, and medieval miniatures who came on my website while cruising the internet. 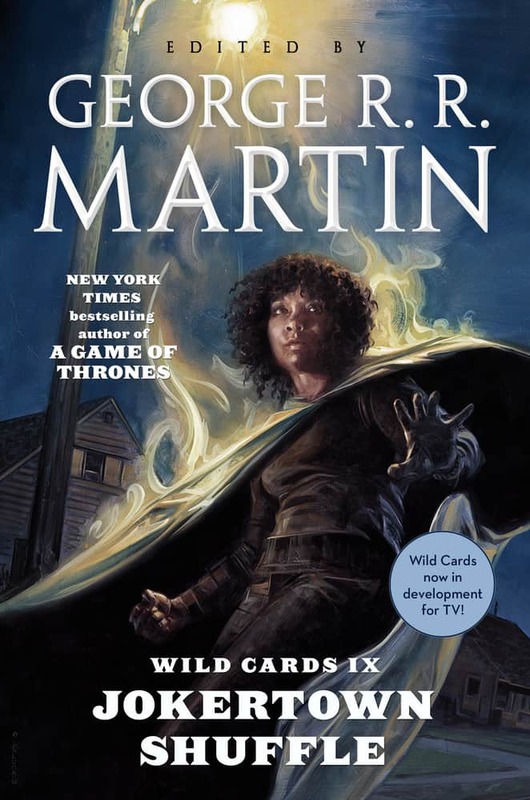 Maybe it was my books that brought you to this website, but now that you’ve seen a little of collection, you think the knights are really cool and have decided to start a collection of your own. Our membership includes folks who have been collecting for decades and own many thousand figures, and those who have just started in the hobby and have only a handful. We have artists at the table who who make and paint their own kits and conversions, and members who like to restore old, broken figures. Our knights include experts on medieval heraldry, plus Courtenay collectors, Marx collectors, Plantagenet collectors, Elastolin collectors, Conte collectors, Vertunni collectors, and fans of all the other makers, major and minor. We compare notes, educate each other, brag about our latest acquisitions, moan about the ones that got away on ebay, discuss, discourse, and argue, trade advice, share photographs of our figures and dioramas, and maybe even swap a few figures every now and again. At present our Round Table seats more than eighty knights — from Austria, Australia, England, Canada, and all over the United States. 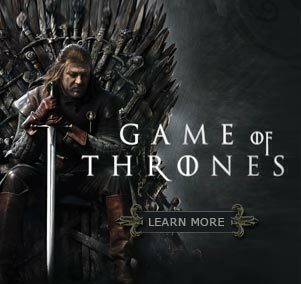 Many of the members collect toy soldiers and miniatures from other historical periods as well, Napoleonics and Civil Wars guys and ancient Romans and Egyptians, but our focus at the table is on the medieval. If you think you’d enjoy talking about your collection with fellow collectors, just drop me an email and I’ll be pleased to add you to our list. Membership entails no charge, no cost, no obligation of any kind. Just collectors talking knights with other collectors.